Cybabalounge offers support for building in web-worlds. You get your own web-world, along with tools to build things to go in it. This article tells how to get your world, go into it, and start building shapes. You learn to use tools by using them, not by reading about them. I made those objects with just a quick read of the documentation. 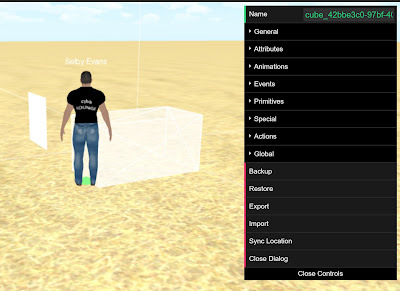 Cybalounge has building tools like those in virtual worlds. The documentation is just now being written. I am working with the documentation to provide instructions for beginners. These instructions are for people already familiar with building in virtual worlds. You can come in as a guest without registering, but guests can't build. Be sure nonprofitvirtualworld is in the url when you go back. There are other sectors in Cybalounge. Your world won't be in those sectors. Your world? Yes. When you register, you get a free world. Registering is done as usual. You give a name, email, and set a password. Then log in. You will arrive at the main nonprofit world meeting pavilion. The pushpin is the rightmost button in the image below. The pushpin shows worlds available. The first worlds are public, not yours. You world is private initially. Click the private button. Note: If you change the world to public, the listing will move to the initial list. The Location Editor is the tool you build with. Then click on the ground to open the construction menu. See the test world image above. The name of the currently selected object is at the top (in green). The initial object is cube_0000000, which is the world cube. That is what you selected by clicking on the ground. Everything you put here will be a child or subsequent descendant of this cube. Practice: In the construction menu click on Primitives. That opens the sub-menu for you to add primitives. Click the Add Cube command. Play with the cube by changing its properties. To edit the properties of an object, click on it to select it. Note that the control menu changes to show and fit the object selected. Position, dimensions, rotation, scale, material (color and texture) and collision. Position is in XYZ coordinates, but note that Y is vertical. Position is relative to the parent object. The parent is the object selected when the new primitive was created. Child prims are linked to the parent prim. The world cube cube is the parent here. You arrived near the 0,150, 0 point. That 150 is the y coordinate. Up-down in this world. The ground is 150 centimeters up from the bottom of the world cube. Rotation has units of degrees. Colors: Choose from the palette or enter RGB values. Textures are images. You choose from the TextureMap drop-down menu. Or from those uploaded to your inventory (instructions coming later). Collision is the reverse of what virtual worlds call phantom. 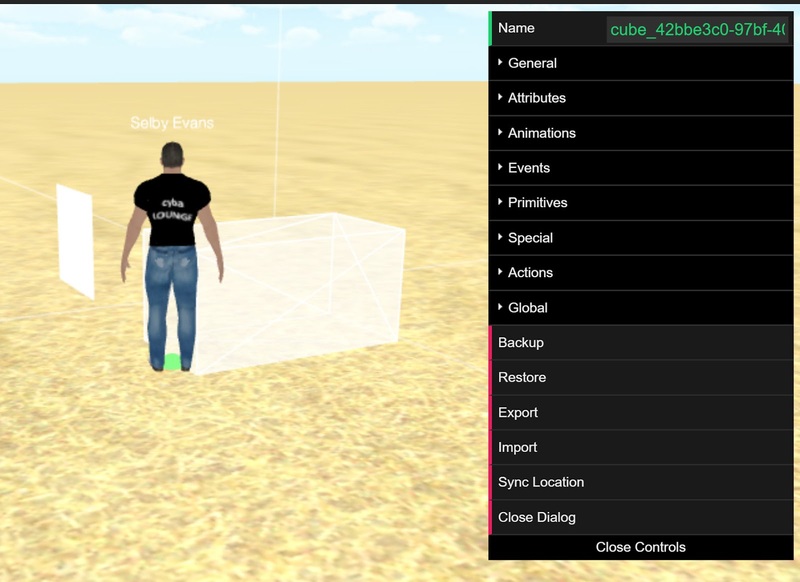 If collision is set, avatars can collide with the object. It is not phantom. Recommendation: don't set mesh objects to collision. A complex shape overloads the physics engine. Make a simple transparent prim shaped to give the collision you need. .
That is one of the benefits of learning in a virtual world. You don't have to read a manual to find out how things work. You just try things and see what the buttons do. No matter what you do, you can always have a do-over. We welcome questions and suggestions. Best post them in comments on this article. If you post them in G+ or Facebook, I may not see them. I can edit/revise the contents here to respond to questions. 10-10:30 am California time most weekdays. You don't need to register if you just want to chat. You can also visit my test world there. Just click on the push-pin and scroll down. Then click on the enter button. This article is intended to help people start learning how to build in a web-world. Apply a texture to an object side. Put up a bulletin-board where I can put messages. Show a web page on a poster inworld. Make an object that opens a web page on click. Let visitors send me an email. Make an object start an inworld video on click. Yes, I know you can think of things I left out. So put them in the comments on this blog and we will get to them. Most of what we want is already in the tools, but I don't know how to do it. Or, to rephrase that in Jedi terms, I don't know how to do it yet. Use as you please with attribution: web link to the original.